What are The Differences Between Diffusers and Nebulizers? Most diffusers use water as the medium for getting the essential oil out into the air for fragrant smells and aroma therapeutic benefits. Diffusing is a great way to utilize essential oils, and they make it so the entire household can benefit from just a few drops. But, did you know there is another way to spread essential oils around the house? It’s called a nebulizer, and though less commonly used throughout the everyday household, it is another truly effective way of getting the therapeutic benefits essential oils have to offer when used aromatically. The main difference between a diffuser and a nebulizer is a diffuser uses evaporated water particles to transport the essential oil out into the air, unlike a nebulizer, which processes essential oils into an almost gas-like state. Both a nebulizer and diffuser are great choices for your private label essential oil needs, and they both cost around the same amount of money. Some of the main things to consider when choosing between the two are sound, humidity, and efficacy. 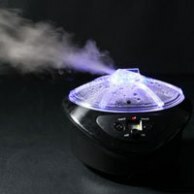 While a diffuser does make a little bit of noise, it’s typically just the slight sound of the water percolating out. The sound of a nebulizer is a bit less pleasant as it makes somewhat of a buzzing sound while running. If you are someone who constantly needs a quiet space, then a nebulizer is probably not the best choice for you. If your home has mold or humidity issues, you may want to choose a nebulizer over a diffuser based on the fact that it relies on the continuous evaporation of water in order to operate. By using a nebulizer, you will get all of the benefits of the essential oil without exacerbating the humidity issue. If you are of the more scientific-minded, then you most likely will want to go with the nebulizer. Since the essential oil particles are so much smaller, they technically have a more immediate effect than those emitted by a diffuser. People start using essential oils for a variety of reasons. But one of the most common is for their aroma therapeutic effects- particularly when it comes to stress reduction. This is where both a nebulizer and a diffuser come into play; you can come home from work, add a few drops of your favorite oil, and start to relax as your stress melts away. You can use any kind of essential oil you want. The only exception is for very resinous oils, as they are too thick to be properly diffused or nebulized. But other than that, feel free to experiment with new oils you’ve never tried before and special blends that you can either make yourself or buy online. Tailor the experience to your needs and use lavender when you want to relax and calm down, lemon for when you need to focus and be productive, and eucalyptus or Thieves Blend when someone in the house is sick. Whether you choose a nebulizer or diffuser for your private label essential oils, rest assured both choices are excellent ways to use essential oils in your everyday life. Pick the one that feels best for you, and rejoice in the amazing therapeutic and aromatic properties of high quality private label essential oils. RainShadow Labs only uses the best natural and organic ingredients in all our products, and that absolutely includes our essential oils. Contact us now to learn more about us, to get help choosing a new oil to try, or to start formulating for your own private label skincare line.